The summer vacation season has passed, the kids are back in school, and it is time to start preparing your home for winter and the coming holidays. Now is the time to start planning your final home improvement projects of the year, and it is also the right time to do any necessary repairs or additions before the rain starts. Since it is also the time of year when certain contractors get very busy, it is particularly imperative that you get on the schedule of your roofer, gutter installer, HVAC repairman or any other contractors that folks are going to start calling once the rain starts falling or the temperature starts dropping. Some of these folks are already booked through the beginning of the year, so you simply cannot put off scheduling repairs that need to be completed before winter officially arrives. Of course, preparing your home for winter is not the only reason to take on those home improvement projects you have been putting off: It is also time to make sure your home is in great shape for all of those guests who will be visiting you over the next couple of months. You know that you will likely be much too busy to contact your irrigation contractor once November hits, and once Thanksgiving arrives, you may not have the time or energy to worry about trying to get any type of home improvement project started. But if you begin the process now, you will not have to worry about it later, and you can rely on your contractors to finish the projects for you while you take care of other holiday prep. If you are concerned that your budget might not cover all of the home improvements you were hoping to do before the holidays come and your family starts showing up on your doorstep, keep in mind that the HERO Program provides equity loans for a wide variety of improvement projects that can make your home more water or energy efficient. The Home Energy Renovation Opportunity (HERO) Program is a relatively new financing option that allows homeowners to borrow up to 15% of the equity in their homes to make eco-friendly home improvements. There are more than 900,000 approved products in more than 50 product categories, and there are hundreds of local contractors who are registered with the program and able to complete HERO-financed projects. Here are six home improvement projects you should consider doing now (including some that are eligible for HERO financing). 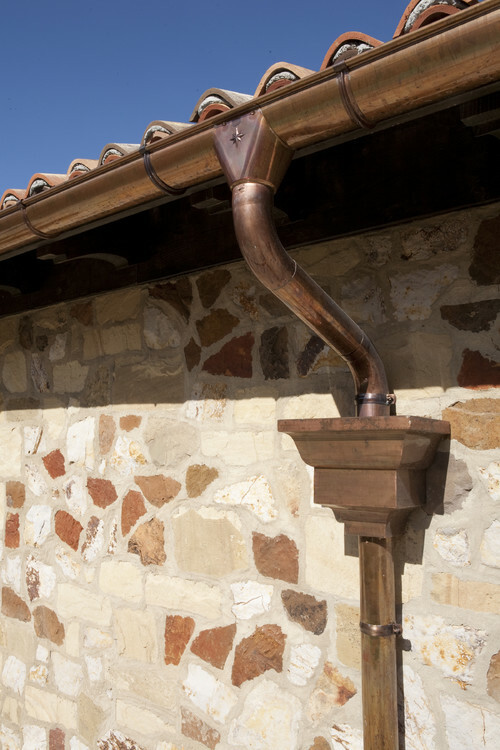 There are plenty of homes in Southern California that do not currently have a gutter system. Most years, this is not that big of a deal, since we do not get all that much rain. However, this year is an El Nino year, and the experts are predicting a wet winter. And, really, even in years with average rainfall, gutters placed over entryways can make it so much nicer for you, your guests, your children and your dogs to come and go through the front and back doors. As an added bonus, you can connect your downspout to a rain barrel to harvest rain water for later use in your garden. If you have been thinking about having gutters installed, now is definitely the time to contact your favorite gutter contractor or start the search for one. Some gutter installation companies are already booked through January, so call now to start getting bids and get on someone’s schedule. People are taking the El Nino predictions quite seriously, which means roofing contractors are booking up almost as quickly as gutter installers. If your roof has seen better days, do not wait until water is dripping on your dinner table on Christmas Day to call a roofer and explore your options. Roof repairs are not always as expensive as we think they will be, so it is worth getting a couple of estimates, even if you are not sure you can afford to fix your roof right now. Once you know the level of repairs needed and how much it will cost, you can work on getting this home improvement project into your budget before the rains begin. Think rain. Think mud. Think about kids running in and out of your house when you have family over for the holidays. All of those things are coming very soon. Do you really want wet blades of grass and mud being tracked into your home? That means that now is the perfect time to get an estimate for that artificial grass lawn you have been thinking about ever since the mandatory water restrictions went into place. 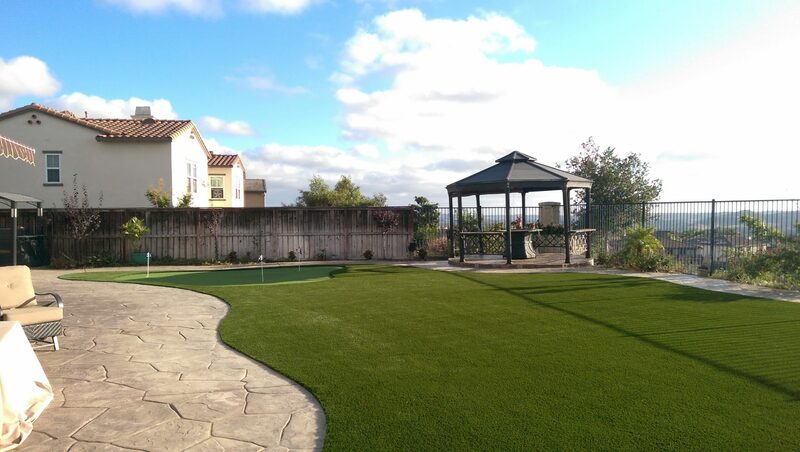 If you are concerned that synthetic turf might cut into your Christmas fund, keep in mind that this is one of the many eco-friendly home improvement projects that can be funded through HERO financing. If your central heating or air conditioning is not functioning quite as well as you would like, you may want to have your system looked at before the temperature begins to drop and you start really wishing your heater was working. This is of particular importance if you think you might need a new unit. This is the time of year when HVAC contractors start to get very busy, since homeowners want their heat working properly before winter. But they will be even busier once sweater weather is actually here. That means that you really should call someone now to make sure you can have your system repaired or replaced before your guests arrive for holiday visits. If you need to replace your system, the HERO Program may be an option for replacing it with a more efficient system. The HERO Program can also help you keep your home at a comfortable temperature in other ways, such as with new insulation or an attic fan. When you are preparing for winter and for end-of-the-year holidays, a paving stone walkway, driveway or patio should definitely be on the list of home improvement projects you are considering. First of all, the immediate and significant change in your home’s overall visual appeal is sure to impress your guests. 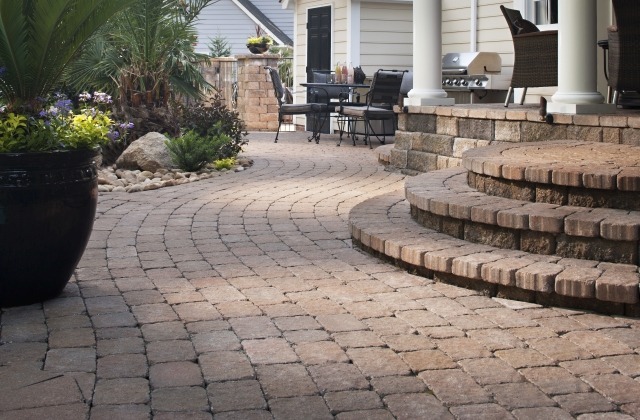 Secondly, we think slip-resistant paving stones are really the best way to avoid muddy patches in your yard and mud being tracked into your home during and after rain. A paving stone patio, particularly when combined with artificial grass, provides an ideal outdoor entertaining area any month of the year, but it will be even more appealing when you can use your outdoor spaces right after the rain. This is another project that can be funded through a HERO loan, so call one of our design consultants today to see how we can help you design and install the perfect paving stone solution for your particular needs. 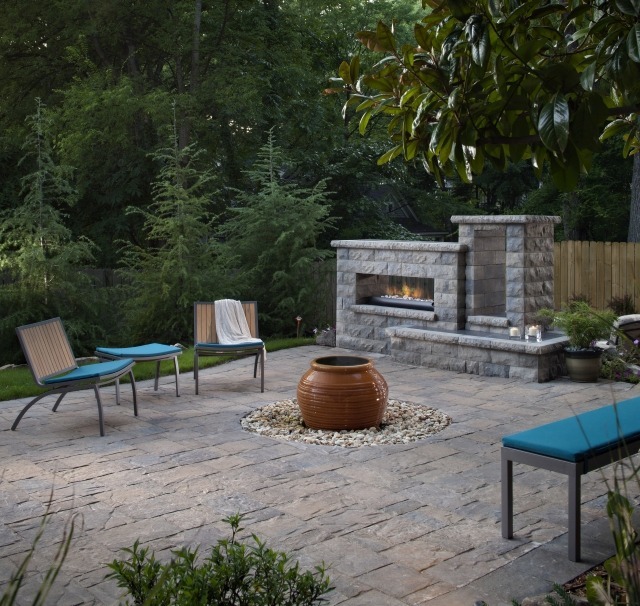 A fire feature really is not necessary to get you through the winter, but it can definitely make outdoor living more appealing in colder months and makes a perfect central gathering place when family or friends are over for the holidays. 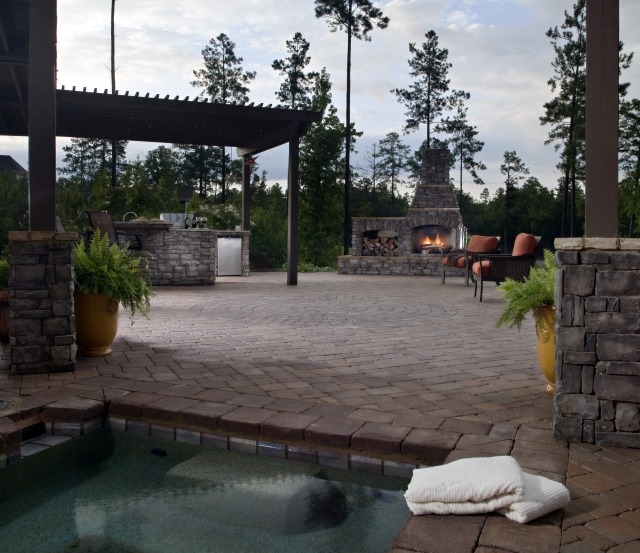 If you get started now, there is still time to have a fire pit or patio fireplace installed before the holidays, but do not wait too long, because you can be sure there are lots of other homeowners thinking the same thing. What home improvement projects are you doing this year to prepare for winter and family holidays?